As you engage potential customers, they start by discovering your product, evaluate whether it meets their needs, look for a good offer, and finally make a purchase. We call this process the customer journey. Use customer journeys to create a model that helps you guide the members of a selected marketing segment through this process by using automated messaging, activity generation, interactive decision points, and more. A simple customer journey can include just two steps: identifying the target segment and creating an activity that addresses the members of that segment. In the following procedure, you'll set up a simple customer journey that sends an email message to all the members of a target segment. A segment containing the contacts you will send your email to. Your segment should include just one or two fictional contacts with valid email addresses that you can receive mail from, like the one you set up in Create a dynamic segment. A marketing email that is both valid and live. You should be able to use the message you designed and published in Create a marketing email and go live. Go to Marketing > Marketing Execution > Customer Journeys. This takes you to a list of existing customer journeys. 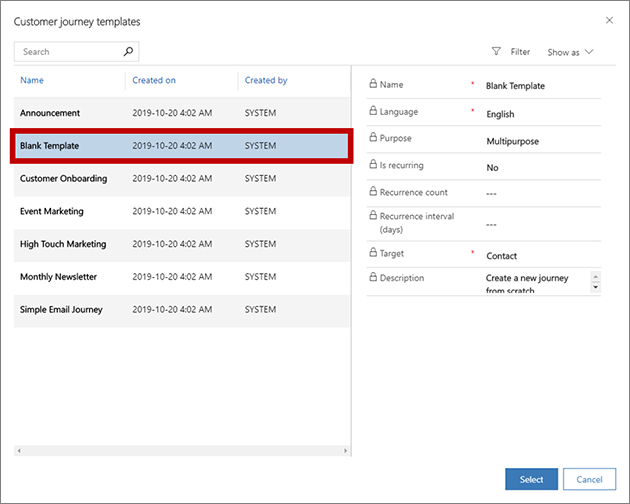 The New Customer Journey page opens with the Select a Customer Journey Template dialog box shown. Each template provides a starting point for designing a particular type of customer journey. The template dialog box provides tools for searching, browsing, and previewing your template collection. Select Blank template, and then choose Select. The dialog box closes, and your selected template is copied to your new journey. Now you are looking at the customer journey designer, where you will assemble a pipeline that defines each step of the journey. Like all journeys, this one starts with the participants, who in this case are the people you specify as part of a market segment. Drag a Segment Group tile from the Toolbox tab onto the first position of the pipeline. 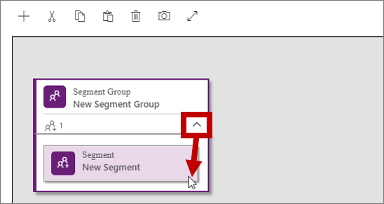 Select the expand button at the lower-right corner of your new Segment Group tile to view the member segments of this group. Right now, there's just one, so select it. With the nested segment still selected, open the Properties tab to the right of the canvas. The Properties tab provides settings that apply to the selected tile. Set the Segment to the name of the segment that you want to target with your campaign. When your customer journey is running, all contacts start at the Segment Group tile, and then step one tile forward and do whatever it says there, and so on down the pipeline—like in a simple board game. Some tiles hold on to contacts for awhile, while others do something immediately and then send the contact on to the next tile in the pipeline. Other tiles can split the path based on contact information or interactions. At runtime, you'll be able to see how many contacts are waiting at each tile, along with a few key results associated with the tile. 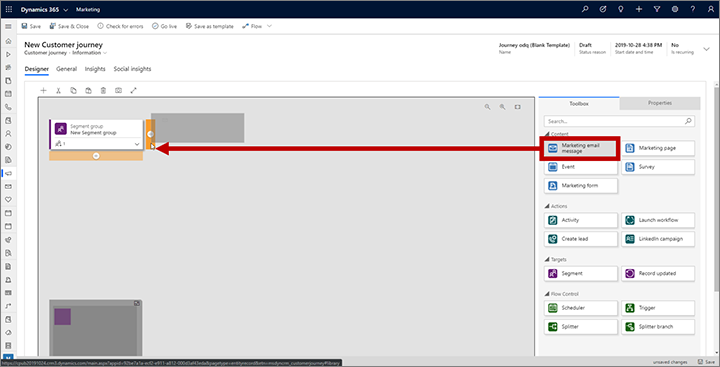 In this simple example, you're going to add just one more tile—an Email tile—which sends an email message to each contact who enters the tile. 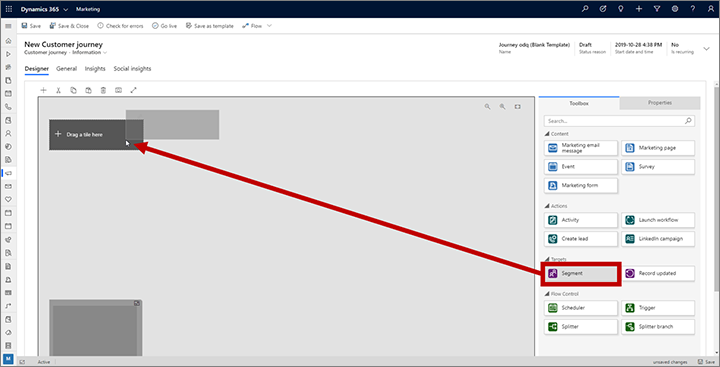 Go back to the Toolbox tab and drag an Email tile to the space immediately to the right of the Segment Group tile. With the new Email tile still selected, open the Properties tab again. Set the Marketing Email Message to the name of the message that you want to send, such as the sample email message you created earlier in Create a marketing email and go live. All the segments and email messages that you reference in your customer journey must be live before you can go live with the customer journey itself. Until now, you've been working on the Designer tab. Now go to the General tab, where you can name your journey and configure its run schedule. Name: Enter a name for the customer journey that you can easily recognize later. This name is internal-only. Time Zone: Select your local time zone (if needed). The other dates and times on the page will be displayed relative to this zone. Start Date Time: Enter the time when the journey should begin processing contacts. When you select the field, a suggested default time is provided. End Date Time: Enter the time at which the journey should stop processing contacts. All actions will stop at this time, even if some contacts are still in the middle of the journey. If you're just testing, allow a couple of weeks. Content Settings: This should already be set to the default content settings record set for your instance. These settings affect the dynamic content of marketing emails sent by this journey (as mentioned in Create a marketing email and go live). While your journey is running, it will continue to process new contacts that join its segment, even if they join after the start date. This means that new contacts can join in at any time until the end date arrives. On the command bar, select Save to save the work you've done so far. The Save button might not always be present on the command bar, especially after you've saved the journey once. If you don't see it there, look for the smaller Save button in the lower-right corner of page, and select it there to save your work. To make sure your journey includes all required content and settings, select Check for Errors in the command bar. Dynamics 365 for Marketing checks it and then displays results in the notification bar. Expand the notification bar to read the results. If you followed this procedure and your email message is live, your journey should pass the error check. If it doesn't, read the error message, fix the reported issue, and try again until it passes. Your journey is now ready to go. To start it running, publish it by selecting Go Live on the command bar. Dynamics 365 for Marketing copies the journey to its email marketing service, which executes the journey by processing contacts, performing actions, and collecting results during the time it is set to run. The journey's Status Reason is updated to Live. It might take a few hours for your messages to get sent, so allow some time for them to arrive in your inbox. After they do, open them and load the images. Then you can go back to Dynamics 365 for Marketing and see how your journey is going. 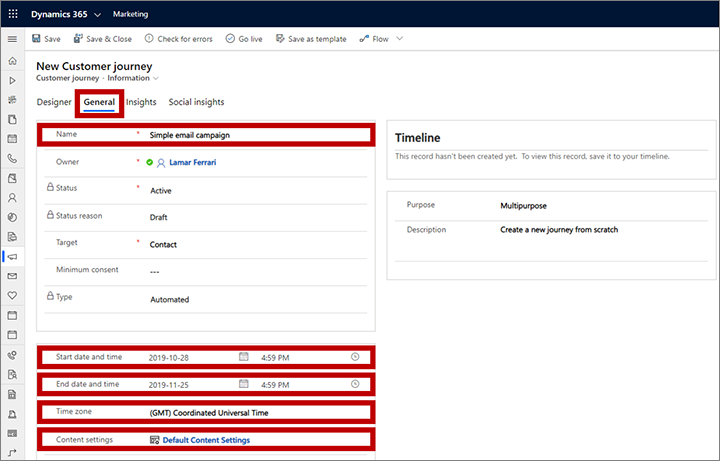 Open your customer journey in Dynamics 365 for Marketing and switch to the Customer journey: Insights form view by using the drop-down list above the journey-name headline. From here, use the Designer tab to see information and results for each tile from your pipeline. Open the Dashboard tab to see detailed analytics. 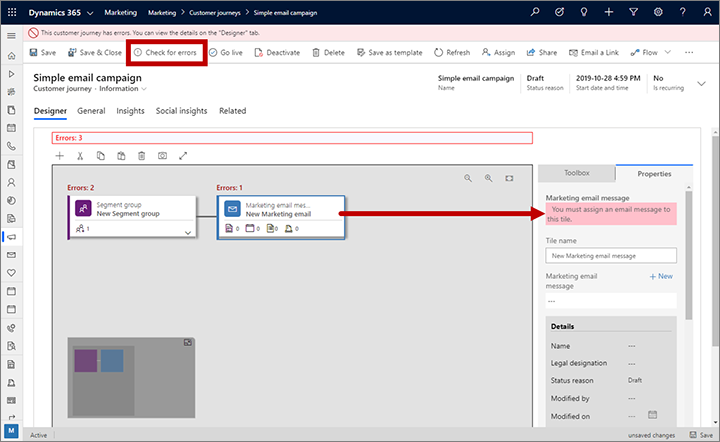 Many entities in Dynamics 365 for Marketing provide an Insights form view for analyzing the results of your marketing initiatives, including marketing emails. For example, try opening the record for the email message you sent with this customer journey and check its Marketing email: Insights form view for even more information.